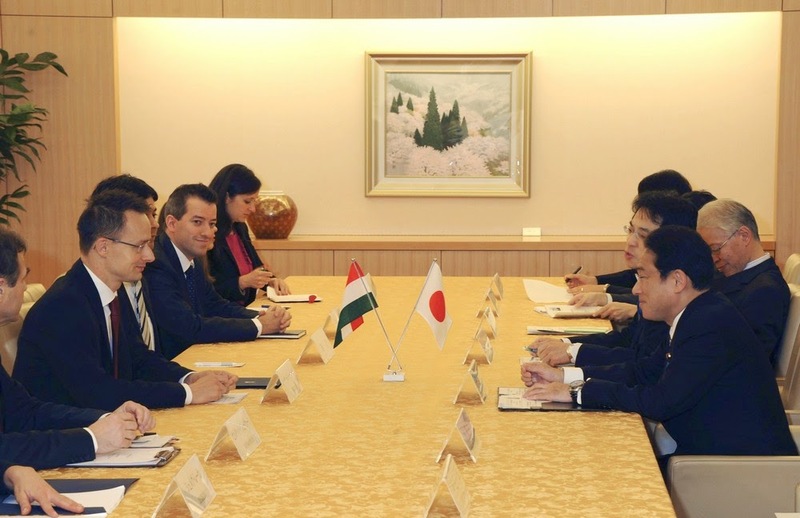 Péter Szijjártó, who was received by Japanese counterpart Fumio Kishida (cover photo), noted that 151 Japanese companies employ a total 31,000 people in Hungary, and noted that seven of those businesses have been included in the government’s strategic partnership programme. The 151 firms have invested a combined 4.4 billion dollars in Hungary, he added. Concerning his talks, Szijjártó said that agreements had been signed with four further companies which would invest 26 billion forints (EUR 84m) in Hungary and create 400 jobs. Two of the investors are active in the automotive sector, one in the food industry and another in the hotel industry, he said. He noted that in central Europe, Hungary is a top exporter to Japan with bilateral trade exceeding 2 billion dollars. This is why the Hungarian government, in accordance with Japan, wants the EU to conclude a free trade agreement with the Asian country, Szijjártó added. He said that an agreement was also reached on strengthening cooperation between the Visegrad Four grouping and Japan, a priority for Hungary during its V4 presidency starting in July. Current political issues were also discussed, Szijjártó said, adding that the Hungarian and Japanese side both resolutely condemn North Korea’s recent ballistic missile test which fundamentally threatens regional security. Hungary’s foreign minister has agreed with Japanese counterparts on expanding Hungarian food exports to Japan and on investments in Hungary’s autos industry. Peter Szijjartó told MTI by phone on the second day of his official visit to Tokyo that Japan is not only Asia’s biggest investor in Hungary but also an important export market for Hungary. It imports premium products such as Herend porcelain and is Hungary’s second most important export market in Asia. Among the agreements, Szijjartó highlighted one on launching the export of wild boar meat. The minister also met officials from Japan Auto Parts Industries, the chief executive of Suzuki, as well as representatives from Toyota and Bridgestone. He said that Tuesday’s talks would result in new investments arriving in Hungary, adding that the deals would be inked at a later point in time.